Voicemail: (702) 877-6635 · http://www.lasvegasfop. 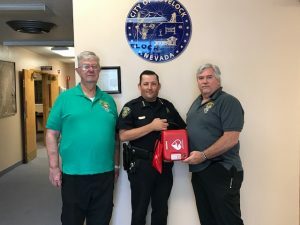 The police jurisdictions of Elko and Lovelock Nevada recently received an Automated External Defibrillator (AED), for police cruisers. The donation came through the Fraternal Order of Police as part of a grant from Firehouse Subs Public Safety Foundation. AEDs are a device that measures heart rhythm and can send a shock to the heart to treat sudden cardiac arrest. With police officers’ often first on the scene, especially in rural areas, these devices are becoming more and more important. FOP State President Moody said that the donation will help save lives. In 2005, the Firehouse Subs founders established the Firehouse Subs Public Safety Foundation with the mission of providing funding, life-saving equipment, and educational opportunities to first-responders and public safety organizations. Through the non-profit 501(c)(3), Firehouse Subs Public Safety Foundation has given more than $24 million to hometown heroes in 46 states, Puerto Rico and Canada. 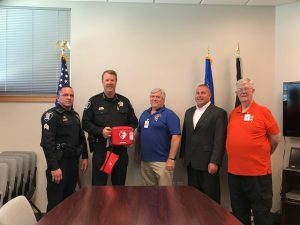 The FOP distributed the AEDs to state lodges that worked with local law enforcement to identify areas with the biggest need for this life-saving device. Learn more about the Firehouse Subs Public Safety Foundation at www.FirehouseSubsFoundation.org and about the FOP at www.FOP.net.